Generally speaking, there are two types of beaches in Barbados: resort-style beaches where you can swim and/or relax on the sand and beaches that are known primarily for their scenic beauty. The first category line the island's western and southwestern shores while the latter category dominate the eastern and northeastern shorelines. One category features the calm waters of the Caribbean while the other is washed by the turbulent waters of the Atlantic. On this page, we discuss the resort-type beaches. (For the most famous of the scenic beaches, Bathsheba, click here). The beaches along the western shore feature the calmest waters. Lined with palms and other shade trees, the waters lap on powdery sand. Not surprisingly, many of these beaches are bordered by a string of resorts and expensive private villas. The good news is that since all the beaches in Barbados are public, anyone can use any beach. However, property owners can and often do prohibit visitors from accessing the beaches by crossing their property. Consequently in such cases, visitors must use one of the public access paths to reach the beach. The best known of the west coast resorts is the Sandy Lane Resort, which is popular with A-list celebrities. It dominates the ﻿Sandy Lane Beach﻿ but visitors can nonetheless use this golden sand beach although not the resort's facilities without its permission. 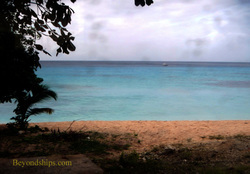 ﻿Payne's Bay Beach﻿, just south of Sandy Lane, is known for watersports and snorkeling. 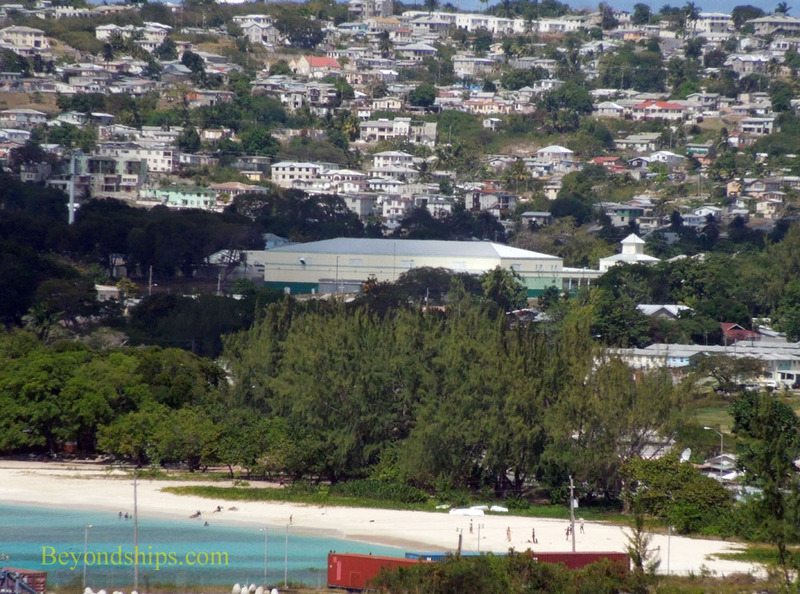 Cruise visitors can walk from their ship to ﻿Carlisle Bay Beach﻿ just outside of Bridgetown. There you will find a white sandy beach with bars, restaurants and facilities for renting chairs and umbrellas. ﻿Above: Paradise Bay Beach was once home to a Cunard resort. The waters along the southern coast of the island tend to be more turbulent than the west. Nonetheless, it is home to some popular beaches (see separate article). Indeed, ﻿Crane Beach﻿ has been called one of the most beautiful beaches in the world (See separate article). Its a wide stretch of pink sand lends itself to sunbathing and relaxing. Meanwhile, its somewhat more vigorous waves are favored by apprentice surfers and body surfers. The beach is dominated by the Crane Beach Hotel but there is a public access path. There are also vendors who rent chairs and other facilities to visitors. Another popular south coast beach is ﻿Accra﻿ (also known as Rockley). With moderate waves, it is known for wind surfing, body surfing and boogie boarding. Chairs and umbrellas can be rented there and there are bars and restaurants nearby. ﻿Welches Beach﻿ is one of the quietest beaches on Barbados. It features calm waters and a wide strip of white sand. However, it has little shade and there is no lifeguard on duty.